The new P4C800 Deluxe sports all the usual frills and on-board features that you've come to expect of an ASUS motherboard. With new features like the Ai Net, ASUS has given users more reasons to consider their very own Canterwood solution. 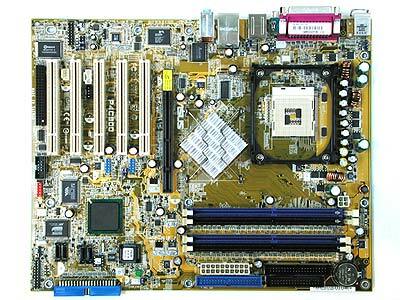 Unlike most 875P motherboards, ASUS chose not to use the ICH5R south bridge but instead used the lower cost ICH5. Although what's missing may just be the Intel SoftRAID support, certain users may miss the flexible RAID upgradability offered by Intel's RAID software. Look at it this way, they could have added yet another 'Ai' feature with the ICH5R but cost seems to be of paramount concern to ASUS. The other features on this board are quite similar to other boards. On-board devices such as FireWire, Promise RAID controller and Gigabit LAN are just some of the frills you'll get with the P4C800 Deluxe. ASUS boasts of the Ai Net feature offered by the 3COM Gigabit controller with a software that let users troubleshoot and diagnose network problems. However, with a 3COM controller residing on the 32-bit/33MHz PCI bus, things couldn't get any better since there's a potential bottleneck there. Although we understand there's a need for lower costs, the dedicated CSA bus is really the way to go for high performance Gigabit connectivity. There is no doubt that Intel wants the piece of communications pie so badly that they did not license the CSA bus to other Gigabit solution providers, but there's really nothing else more compelling than the Intel 82547EI Gigabit controller. Bundles with the ASUS P4C800 Deluxe have also been cut, as you'll not find any brackets for its 6-channel on-board audio, FireWire and USB 2.0 ports. Again, we think ASUS is trying to target this product to the mainstream segment with lower costs by removing all the usual frills. In addition, only two serial ATA cables were given and no serial ATA power cables were provided with the motherboard. Users going for new Serial ATA drives will need to fork out extra expenses for additional cables. The ASUS P4C800 Deluxe motherboard. Having said all that, we expect the new ASUS P4C800 Deluxe to come at a very attractive price point since ASUS has taken out much of the costs. The performance of the board was good, and it's just as fast as the MSI 875P Neo-FIS2R. Although its overclocking functions are far less attractive, it's nevertheless a very stable product and it could even achieve very high bus speeds. Reaching bus speeds as high as 300MHz (1.2GHz FSB), it's a testament to ASUS' quality and stability that not many could rival.